European Union Embassies accredited in the country, the EU Delegation and the Swiss Embassy present a selection of 21 European films, both dramatic and comic, exploring topics ranging from love to human rights to environmental issues. Films will be shown in their original languages, with subtitles. “Festival de Cine Europeo” takes place July 23-August 12 at Cine Magaly, downtown San José. ₡1,800 – 2,300 ($4 – 5). More info: Cine Magaly Facebook page or 2222-7241. The annual show seeks to inspire interest in the history and culture of other nations. The festival features groups of young people from around the world who present their cultures through dance, music and singing. “Doceava Muestra Folclórica Internacional” takes place July 18 at the Melico Salazar Theater, downtown San José. 7 p.m. ₡3,000 – 8,000 ($6 – 16). More info: Melico Salazar website. The Costa Rican documentary “The Devil’s Elbow” tells the true story of the murder of six politicians in December 1948, in the aftermath of the Costa Rican Civil War. “El Codo del Diablo” will be shown July 18 at Sala Gómez Miralles, Centro de Cine, San José, Av. 9. Free. 7 p.m. More info: GAMCultural Website. A play that tells three stories in three half-hour acts. “The Story of an Abscess, a Woman and Two Men” features a protagonists plagued by an odd tongue condition that affects not only his health but also his love life with his wife. “The Story of How Our Friend Panchito Felt Responsible for the Epidemic of Bubonic Plague in South Africa” is about a man affected by the economic crisis who takes a job that threatens his health and even human rights. “The Man Who Became a Dog,” is, well, about a man of canine persuasionswho can’t quite tell his paw from his foot. “Historias para ser contadas” continues until July 26 at Teatro de la Aduana, San José, Av. 3. Thursday-Saturday at 8 p.m. and Sundays at 5 p.m. ₡2,500 – 5,000 ($5 – 10). More info: RedCultura Website. A celebration of music and technology with workshops and lectures designed for sound and acoustic engineers, but also concerts and other performances for the general public around the city. “Festival Sonoro” continues until July 23. For schedule and tickets, visit the Festival Sonoro Website. Curious about Peruvian gastronomic culture? The Marriott Hotel will cap off three days with changing Peruvian buffets with a special Sunday-afternoon show featuring Peruvian music, a Peruvian mini-market and special desserts. 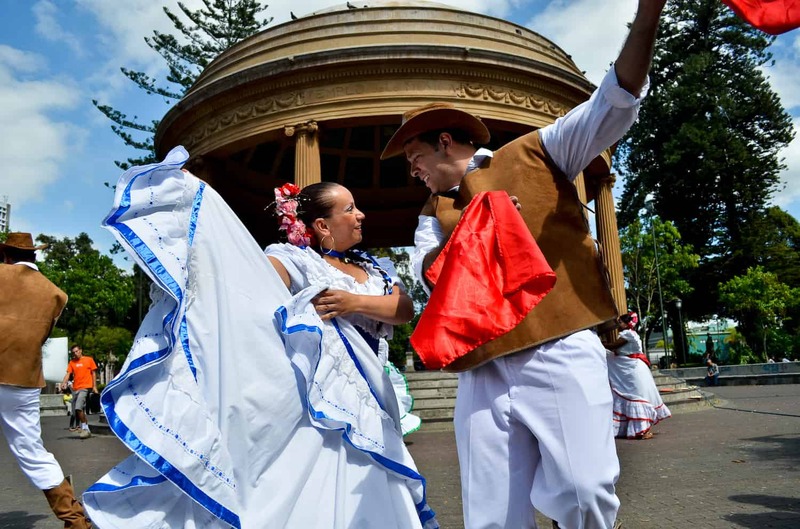 “Festival Peruano” takes place July 17-18 at 6 p.m. and July 19 (the musical show and mini-market) at 12 m.d. At Hotel Costa Rica Marriott, Belén, Heredia. $27 – $55. More info: Hotel Costa Rica Marriott Facebook page. “Piromacia” – Let’s play with fire at the Piromacia Concert in the company of bands such as Zigurats, Dios Desde la Máquina, Jesús Con Corte Militar, and Ave Negra. July 17 at Amon Solar, Barrio Amón. 8 p.m. ₡3,000 ($6). Garbanzos and Endemia – Band Endemia is on its tour “Madrefuria 2015,” and Garbanzos is leading up to its Pro-Tour to Mexico in September 2015. As guest band and presenting their debut, reggae band Legal Sensi. July 17 at El Cuartel de la Boca del Monte, Barrio California, San José. 8 p.m. ₡3,000 ($6). Costa Rica Original Rock – A national rock concert that features bands such as Fonk Norris, Kaína and ATM. July 17 at Club Oz, Paseo Colón, San José. 8 p.m. 2,000 ($4). More info: Costa Rica Original Rock Facebook page. Tenth Aniversary of Sight of Emptiness – The Costa Rican metal band is celebrating its tenth anniversary with a huge concert. July 18 at Mundoloco El Chante, San Pedro. More info: Mundoloco Facebook page. “Keep on Moving”: – Roots Cool & Calm presents a Trojan Records special performance featuring artists including Marvin Selector “Trojan Special Set” – 7 pm, The Roots House Band Ft Fabrizio Walker, Stephie Davis & Rdlf Herrera – 9 pm and “After” with Jr Stepping Selecta – 11 pm. July 19 at Roots Cool & Calm, San Pedro, starting at 7 p.m. ₡2,000 ($4). More info: Roots Cool & Calm Facebook page.